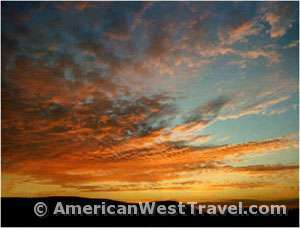 The Death Valley Area Travel Guide profiles Death Valley National Park and nearby attractions. Death Valley offers some of the American West’s most surreal and colorful scenery. With a 2 1/2 to 3 hour drive, it can be toured from Las Vegas as a long day trip although spending a night or more (at comfortable lodging in Furnace Creek, Stovepipe Wells, or camping) would be far more pleasant and less stressful. The more remote and less developed Mojave National Preserve is recommended for campers and hikers. The other sites listed here may be combined with a visit to Death Valley. Keep in mind that all desert sites are remote and extremely hot in the summer. You must be prepared to be self-sufficient if traveling in the summer. Keep well hydrated. Bring ample water in your vehicle and while hiking. While Death Valley is a fairly short distance from Las Vegas, it can feel a lot longer. Once you leave the metro area the distances between the small towns and travel services become long. In the blazing heat of summer the distances can seem very long indeed. You drive through many miles of open desert with very few people or structures. If traveling here in the summer carry plenty of water and supplies in your vehicle, to be as self-sufficient as possible. Fill up your gas tank before driving to Death Valley National Park. While gas is available at Furnance Creek, Stovepipe Wells, and Panamint Springs Resort, it is more expensive than outside the park. Directions: The distance from Las Vegas to Death Valley’s Furnace Creek (park headquarters, traveler services) is 118 miles via NV-160/CA-190 west or 145 miles via US-95 north, about a 2 1/2 hour ride. This can be an excellent, pleasant day trip during the cooler months, with plenty to see and do. Expect to stay one or more nights to see more of the region. Death Valley National Park offers perhaps the most spectacular, colorful, and surreal desert scenery in all of the Southwest. Death Valley is renowned as America’s hottest, driest, and lowest place. There are few places hotter or drier in the world. In a place of great contrasts, the lowest point, Badwater, at 282 feet below sea level, is towered over by Telescope Peak, 11,049 feet above sea level. The park also features sand dunes, salt flats, colorful canyons, even a volcanic crater. There are miles of paved and dirt roads for auto touring, as well as many opportunities for four-wheel driving. One of most amazing sights in Death Valley is Scotty’s Castle, a 1920’s mansion built as a rich man’s retreat. The building and its beautiful furnishings are well-preserved and accessible by guided tour. [Photo, Above Right] A three picture composite of the floor of Death Valley. The lowest point in the western hemisphere, known as Badwater, 280 feet below sea level, is towards the left of the image in the salt flat. The photos were taken from the famous vista point, Dante’s View, more than 5,500 feet above Badwater. The strange shadowings were from the broken clouds overhead. The park’s center of activity is at the Furnace Creek Visitor Center (on CA-190, about 20 miles west of Death Valley Junction). Lodging, campgrounds, and food are available. Lodging varies from rustic, to motel rooms at Furnace Creek Ranch, to luxurious accommodations at the Furnace Creek Inn. The park is extremely popular during the winter, and reservations are strongly advised. Directions: Access from Las Vegas is US-95, then NV-373 or NV-374; or NV-160, then county-210. Visit time: at least two or three days. Display a viewable copy of the Death Valley Park Map. Scotty’s Castle. Located in north end of park. Access from Scotty’s Castle Road, or NV-267 from Scotty’s Junction on US-95. Ubehebe Crater. Large volcanic crater located in north end of park, eight miles from Scotty’s Castle. Rhyolite. Ghost town about five miles west of Beatty. Off of NV-374. Titus Canyon Road. Outstanding scenic drive on rough dirt road. High clearance recommended. Passes ghost town of Leadfield. Off of NV-374 a few mile west of Rhyolite. 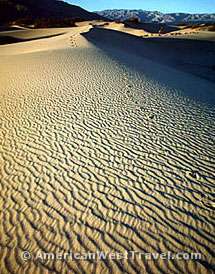 Mesquite Flat Sand Dunes. Large dunes excellent for recreation and photography (right after sunrise is best). Along CA-190 just west of NV-374 junction. Also, good access from Scotty’s Castle Road near NV-374 junction. Devil’s Cornfield. Bizarre formations across CA-190 from sand dunes. Mosaic Canyon. Interesting, easy hike through colorful canyon. Turnoff just west of Stovepipe Wells Village. Salt Creek. Nature trail on CA-190 about two miles north of Beatty Cutoff. Harmony Borax Works. Nature trail on CA-190 a few miles north of Furnace Creek. Furnace Creek. Park headquarters, lodging, camping, services. Junction of CA-190 and Badwater Road. Artists Drive. One-way side road (about five miles) featuring colorful Artists Palette. Max vehicle length 25 feet. Devil’s Golf Course. Unusual vista point. Badwater. Lowest elevation in the U.S. at 282 feet below sea level. In the midst of an enormous salt flat. South of Badwater. Road continues south and then east for another 55 miles to the town on Shoshone on NV-127. Excellent scenery. Stop at Ashford Mills ruins site. Zabriskie Point. Colorful vista point. Twenty Mule Team Canyon. One-way side road (about two miles). Dante’s View. Park’s most famous vista point. View straight down to Badwater Salt Flats, over a mile below. Narrow, winding, 13-mile road. Trailers must be dropped at parking area, five miles before the vista point. Max vehicle length 25 feet. One of the newer national park units, Mojave National Preserve offers more remote and less crowded recreation. Rose-colored sand dunes, volcanic cinder cones, Joshua tree forests, and mile-high mountains are found along the preserve’s scenic roadways. There are numerous paved roads for easy auto touring as well as many four-wheel drive routes, including the historic Mojave Road. There is an interpretive center in the town of Kelso and campgrounds at cooler, higher elevations. Directions: The preserve is accessed from I-15, an easy drive from Las Vegas (67 miles to Cima Road or 93 miles to Baker, then south). Visit time: at least a day trip, more to experience the area. A good scenic drive starting and ending at I-15: Drive to Baker, then south to Kelso (stop at visitor center), north to Cima, then north back to the interstate. Be sure to download a copy of the Mojave National Preserve News and Guide for additional tips on exploring the Mojave National Preserve. Providence Mountains State Recreation Area is located on the east side of the Providence Mountain range and has dramatic views of the surrounding Mojave Desert. The lower elevations feature many varieties of cactus and yucca in a creosote scrub habitat. The bright red rhyolite in the higher elevations are home to bighorn sheep and pinyon pines. The park’s visitor center is located in the historic home of Jack and Ida Mitchell, who ran a resort here from 1934 through 1954. 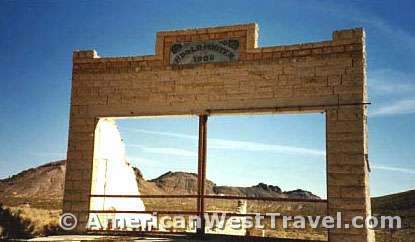 Other features include Mitchell Caverns Natural Preserve. El Pakiva and Tecopa Caverns are filled with intricate limestone formations and can be visited by taking cavern tours. Note: California’s Providence Mountains State Recreation Area is adjacent to the Mojave National Preserve but is closed due to major infrastructure issues. Most of buildings in the park have been repaired and the Cavern has been inspected. A new well is being drilled and the existing generators are being replaced (Providence Mountains is operated solely on generator use). All tours to Mitchell Caverns are also suspended until further notice. Please check with the Providence Mountains State Recreation Area’s website periodically for any updated information. Another interesting stop on the way to Death Valley, Rhyolite is one of Nevada’s best ghost towns. A gold boomtown built to last, Rhyolite had about 10,000 residents at its peak in 1907, with many blocks of stone and brick buildings. By 1920, only 14 residents remained. Today, only a few buildings remain out in the barren desert. These include the unique Bottle House which was built with 30,000 (mostly beer) bottles. Inside is a small museum with artifacts from the town. There are a few caretakers and volunteer guides who interpret the site for visitors. Directions: The site is about two hours from Las Vegas. Take US-95 to Beatty, then Nevada-374 a few miles west. The east entrance to Death Valley National Park is a few miles west on NV-374. Visit time: a couple of hours. One of the strangest experiences of the remote Mojave Desert, Marta Becket’s Armagosa Opera House is the backdrop for live theater performances on Saturdays, October through May. The one-person show features dance and mime by Ms. Becket who also spent years painstakingly restoring a decrepit 1920s building into a theater. She also personally hand-painted the spectacular murals which cover the interior walls. The adjacent Armagosa Hotel offers rustic lodging and is also decorated with Becket’s unique art. Directions: The complex is in Death Valley Junction (CA-127 and CA-190), en route to Death Valley. The town is also less than ten miles from Ash Meadows (Item 12 above) via county-210. Visit time: overnight if you want to attend the show; otherwise it’s a drive through. An interesting side trip en route to Death Valley, Ash Meadows National Wildlife Refuge protects a desert oasis pockmocked with springs, marshes, and small reservoirs. The refuge provides habitat for at least 24 plants and animals found nowhere else in the world. This is the greatest concentration of species of any local area in the country. An interpretive kiosk and boardwalk nature trail are available. Activities include wildlife observation, picnicking, and hunting. Directions: The refuge is 90 miles from Las Vegas, west on Nevada-160, then west on county-210. Visit time: a couple of hours; possible lunch stop. Goldfield is a semi-ghost town located between Beatty and Tonopah on US-95. It started in 1902 as a gold mining boomtown quickly reaching a peak population of 30,000. When the gold ran out, so did the people, with the population dwindling to 1,500 by 1910. The census of 2000 showed about 400 remaining residents. While still a functioning town, most of the downtown buildings are unoccupied relics of the gold rush era. A 1923 fire burned away most of the wood structures. But a number of large, intricate brick buildings survives to this day. Goldfield remains the county seat, and the Esmeralda County Courthouse built in 1908 is still functioning. The original adjacent jailhouse is still in use. Other major buildings still standing include the Goldfield High School, the Santa Fe Saloon (1905), and the Goldfield Hotel (1908). The hotel was once considered the most luxurious between Chicago and San Francisco, with all the “modern” amenties (like phones and electricity). It is also allegedly haunted and has been featured on numerous TV shows relating to ghosts and paranormal activity.